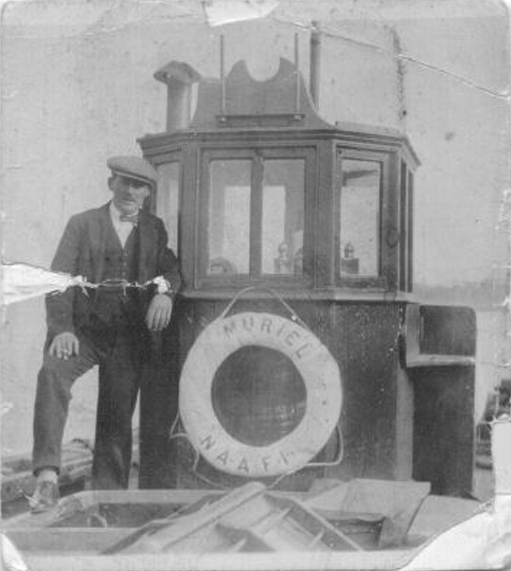 I have just found this picture which I have logged as showing my Grandfather, George Walter Bailey, aboard "Muriel". As I stated in my comment (on picture #345), my father Reginald Walter Bailey was on the "Muriel" when she was a NAAFI supply boat, around the time when the Royal Oak was attacked. However, I am now wondering if this was Hec McCrae, perhaps? George Walter Bailey and Reginald Walter Bailey worked together on NAAFI boats as civilians around Chatham Dockyard and the Medway. After war broke out my Father (RWB) was drafted into the Royal Navy and I believe he was a CPO by the time he got to Invergordon. Hi Andrew. Thank you for the picture of the Muriel. it is the first one I have ever seen. The gentleman in the picture is not my father Hec Macrae. I have just contributed his wedding day picture, picture #1674. I have come across a similar picture of the wheelhouse on the Muriel, but it is clear a different man is featured. He is named as Richard MacRae (sic) skipper and sole survivor of the sinking of the Sterlina on Gizzen Briggs in 1910. The sinking of the Sterlina is a story in itself worthy of a new thread as she was an Invergordon based and crewed vessel. It would be interesting to confirm that the said Richard MacRae was the father of Hec Macrae. Hi Ron, thank you for the information on the Sterlina. My daughter went on to google and we were amazed to discover the whole story. The picture is Richard Macrae the father of Hec Macrae. I do have the newspaper cuttings of the Ross-shire Journal. It is the only picture I have seen of my grandfather. I wonder if I know you Ron, let me know, you have been a great help. Muriel, I came across the details of the Sterlina when visiting the café in the Carnegie Hall Portmahomack last week. There is a framed report on the wall there which I have photographed and sent in to this site for inclusion if it is of suitable quality. As a schoolboy I had a trip or two round the fleet on the NAAFI boat with your father. I think I was a year behind you in school.